More than 20 years after Ten, Pearl Jam still puts on electrifying performances and continues to innovate musically. With a US tour announced that will cover 22 dates in 18 cities, Eddie Vedder and Pearl Jam will be electrifying crowds everywhere with their brand of music and live performances that remains timelessly relevant. 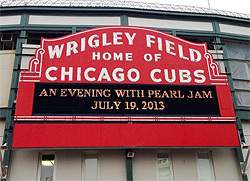 Order your Tickets to see Pearl Jam today! Order online or call (855) 305-4862. The following events and venues match your search for “Pearl Jam”. To sort the list, click on the column header. To find tickets for the given event, date & time, click the tickets link in that row. To find events taking place at a matching venue, click that venue name.